It's the one with the door that opens automatically! Today, more than ever, you need reliable and easy to use products from a trusted partner who understands your sterilization needs. 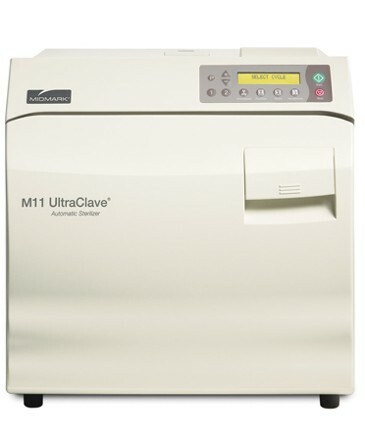 The Midmark M11 UltraClave® Automatic Sterilizer was specifically designed and engineered to meet those needs. The intuitive display and simple prompts help you easily select the cycle you need... whether it is for unwrapped items, pouches, packs or handpieces. 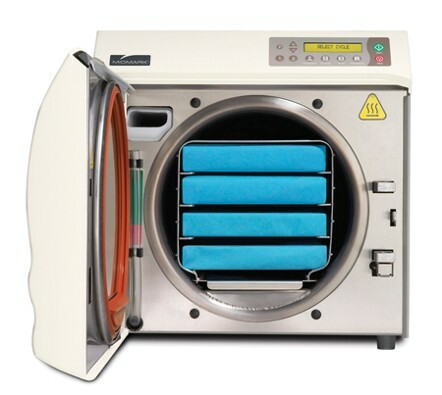 Once the sterilization process is complete, the door conveniently opens automatically and quietly to dissipate the steam and provide fast and efficient drying time of your instruments. 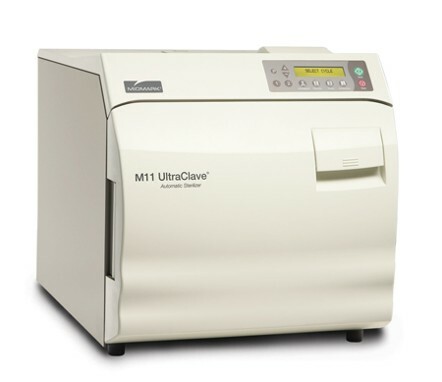 Create peace of mind by making the healthcare market’s leading autoclave... the Midmark M11 UltraClave... your preferred office choice. Holds four standard 8" x 11" cassettes. The LCD display indicates cycle selected, cycle temperature and exposure time. When the cycle enters sterilization mode and dry mode, the remaining cycle time is displayed as well as temperature and pressure. Once the sterilization is complete, the door opens automatically and quietly to dissipate steam and dry your instruments. You’ll have dry, sterile instruments every time. If the door is not closed completely or the reservoir water level is low, the LCD display will provide the appropriate message. In either case, sterilization can’t continue until you’ve attended to the unit. For ease of draining and filling, the Midmark M11’s reservoir fill port and drain tube is in the front of the unit, not on top or in back. The Midmark M11 printer accessory provides a permanent record of cycles, times, temperatures and pressures during a cycle. Programmable controls allow for creation of different cycle parameters for special sterilization needs. Programmable buttons allow you to change the following: Time (3 to 90 minutes), Temperature (230 to 275?F), Dry Time (0 to 60 minutes), or Vent (slow or fast). The #1 and #2 buttons allow you to store the change if desired. Four pre-programmed sterilization cycle controls: Unwrapped (132º C or 270º F for 3 minutes), Pouched (132º C or 270º F for 5 minutes), Packs (121º C or 250º F for 30 minutes), Handpiece (unwrapped and pouched) (132? C or 270? F for 6 minutes). Indicates cycle selected, temperature and exposure time. During the cycle, the display shows messages describing status. When the cycle enters sterilization mode and dry mode, remaining time is displayed as well as temperature and pressure. 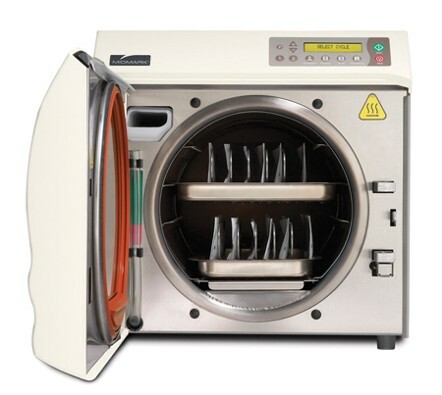 The Midmark M11D AutoClave® Automatic Sterilizer offers easy, effective sterilization but without the convenience of a door that opens automatically. One button starts the cycle... but at the end of the automatic sterilization process, you need to manually open the door within 30 minutes of completion to activate the dry cycle. This extra step is the only physical difference between the Midmark M11D and its automatic counterpart. DENTAL STERILIZERS, DENTAL AUTOCLAVES, AUTOCLAVES, STERILIZERS, MIDMARK STERILIZERS & AUTOCLAVES, TUTTNAUER STERILIZERS & AUTOCLAVES, HARVEY STERILIZERS, STEAM STERILIZERS, STEAM AUTOCLAVES, BARNSTEAD STERILIZERS & AUTOCLAVES.